Leading digital marketing company Intergage has launched a brand new website that shows quickly and easily how firms can build online traffic and boost profits. Managing Director Paul Tansey said: “This new website is not just about showing off, it’s about giving our clients another tool for their web marketing, showing them what we can do. “At Intergage we want to give you all the help you need to succeed online. Whether it’s training, mentoring or carrying out the work, we’re here to help” he added. With a wide range of digital marketing services, Intergage is able to offer a holistic approach to companies’ web marketing needs. Intergage has honed its web marketing services with years of experience and is constantly evolving as the sector develops. Social Media Marketing (SMM) now has a larger and more detailed dedicated section on the website, highlighting its crucial importance to businesses and organisations. Training courses are run all year round to give companies all the tools they need to become expert at web marketing. Intergage also runs exclusive seminars and workshops which are free to clients. One such course, the Nine Week SEO Mission, is particularly popular. These fully interactive training sessions enable clients to learn all the basics necessary to make their websites more search-friendly. Intergage was also one of the first agencies to develop a website content management system that enables companies to update their websites quickly and easily. SEO friendly – Intergage’s CMS gives companies all the tools they need to make their content highly visible to search engines and clients. 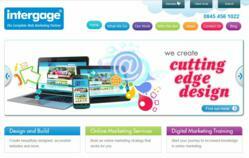 Intergage builds a wide range of websites for its clients. Features include video, e-commerce and purpose-designed software for the charity and recruitment sectors. Intergage works with clients every step of the way to develop their websites they need – from the initial meeting through to launch day. Intergage now has more than 300 clients across the UK. Its growing client base is testament to its expertise and industry-leading customer support. Paul Tansey said: “Our steady growth is due to our transparent and results-driven approach to web marketing. “With the team expanding and a fresh new website, we will continue to exceed expectations,” he added. Discover how intelligent web design, ROI-focused web marketing services and innovative Social Media Marketing can help your organisation connect with its online target audiences - contact Intergage Marketing Manager Emma Barrow on 0845 456 1022. Intergage Ltd is the complete Web marketing partner, a leading UK digital marketing agency that continues to expand and recruit the brightest staff. It currently has two offices in Poole, Dorset and Chandler’s Ford, Hampshire. All Intergage services have a clear focus on providing their customers with a return on investment from their Web marketing. comprehensive Web marketing training to empower you and enable you to manage SEO, PPC, Social Media and the Intergage Content Management System. Intergage is committed to a long-term relationship with each and every client and is constantly seeking ways to improve your website results. Intergage boasts more than 300 clients. Having started the business 11 years ago, Directors Paul and Gareth Tansey are proud to have retained at least 95 per cent of clients year on year. For more information about Intergage, any of the services it provides or just to have a friendly chat with a team member contact Marketing Manager Emma Barrow on 0845 456 1022.